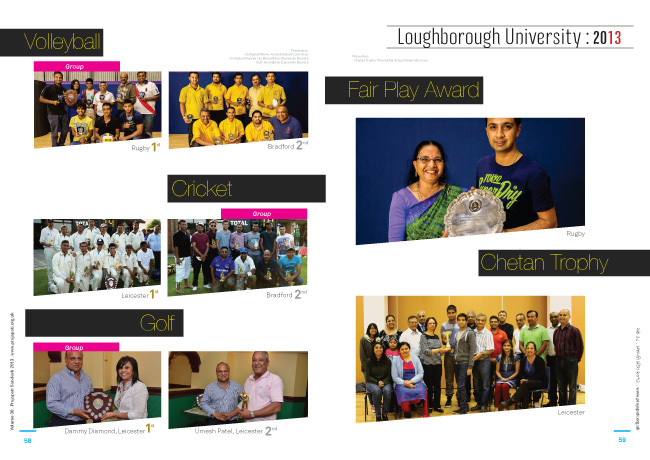 You need to showcase your Association’s activities! Or announce an event with a unique publicity and a publication! Publications are a perfect way to keep membership involved and acts as a powerful tool. A good mix of messages, reports and images makes a compelling, strong and influential tool for the membership. With our experience we help you put a publication together– whatever size, pagination, content and advertising, editorial mix, images and help to coordinate this with a number of your internal stake holders. 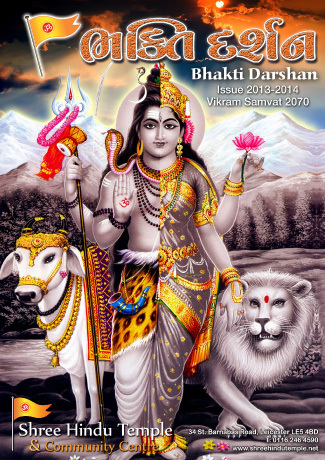 Bhakti Darshan is an annual publication printed for the Shree Hindu Temple and Community Centre, Leicester, established in 1969. 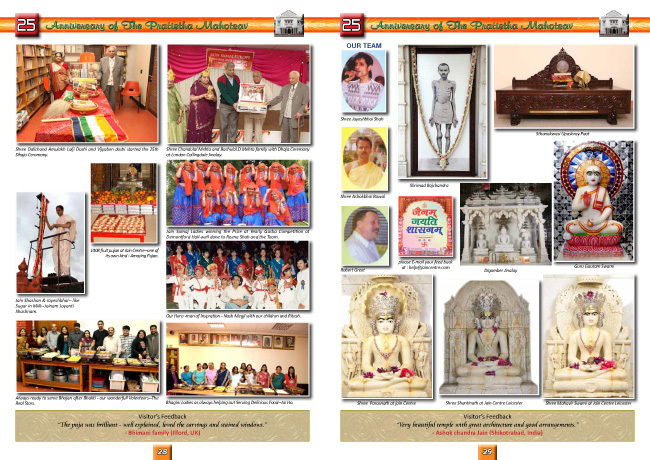 It is a registered charity and the first Hindu Temple to be opened in the United Kingdom. The early publications were bi-monthly newsletters which was only 16 pages and predominately in black and white. 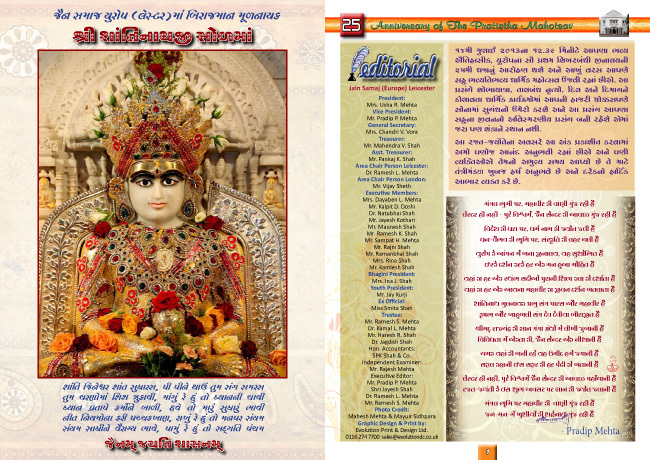 The publication expanded to 40 pages with a combination of Gujarati and English language articles which was always popular for the visitors to the Mandir. 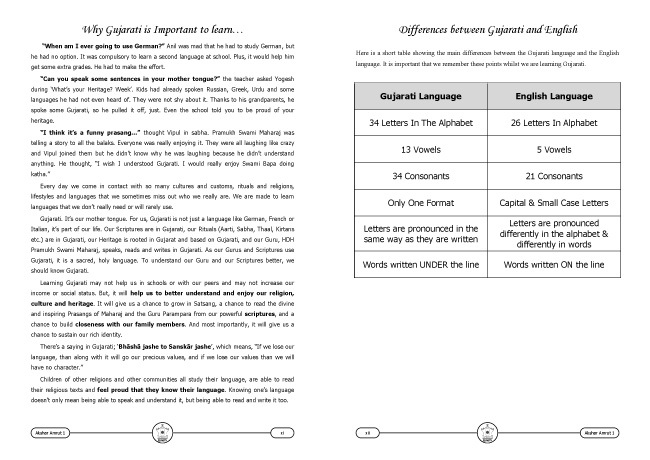 In recent years the publication‘s format has changed to B5 size (168 x 240mm) to improve overall “look & feel” and also to make it easier to read and store.The 2013 issue has 128 pages all in full colour. 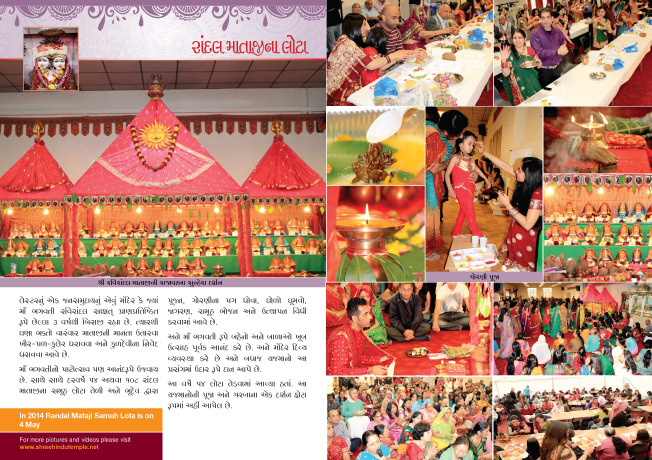 Each event at the Mandir is celebrated with joy and great enthusiasm throughout the year, this is clearly seen in the publication’s design and layout. 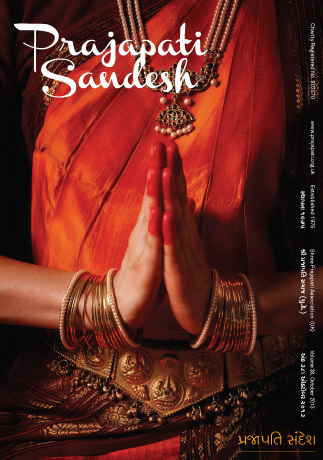 We have been associated with Shree Sanatan Mandir for over 20+ years. 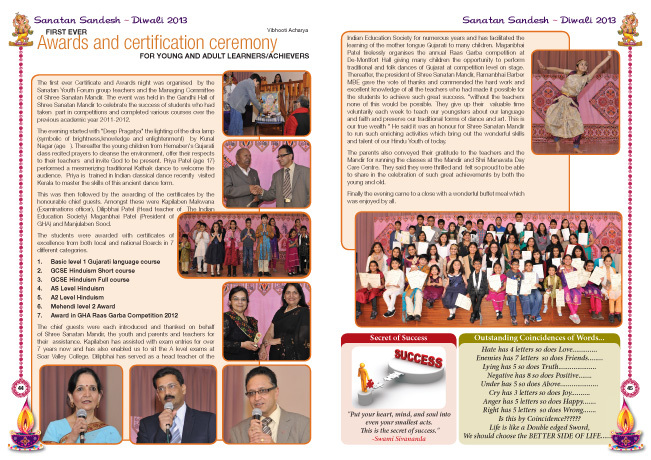 The small A5 newsletter ‘Sanatan Sandesh’ has evolved into a prestigious annual event which any organisation can be proud of. 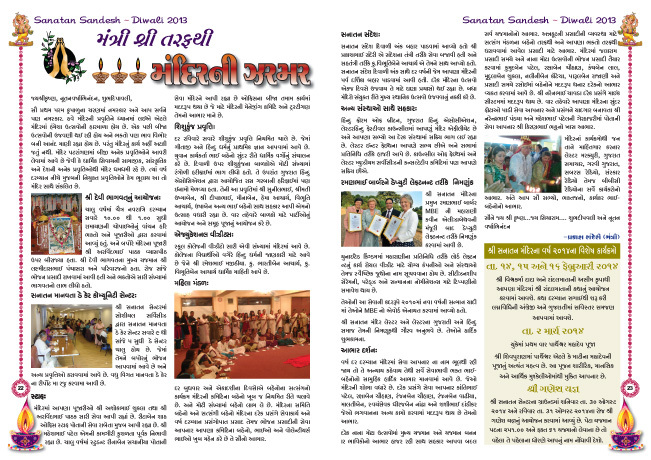 The Sandesh is distributed free during Diwali. 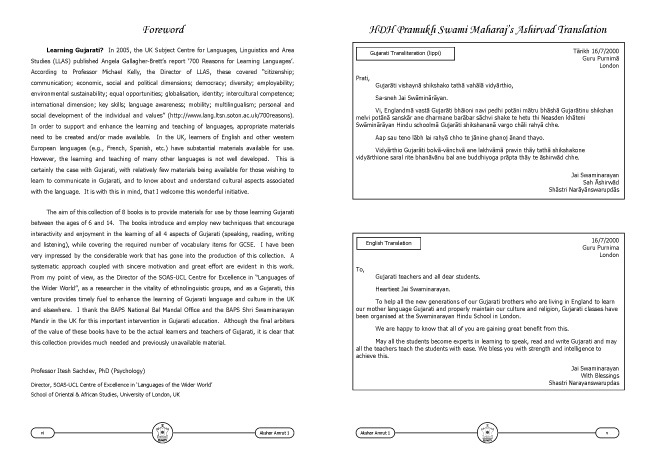 The contents which includes messages from officers, well wishers, community news, activity reports, visitor to the temple, youth reports and special account of major events in a mix of picture and editorial copy. 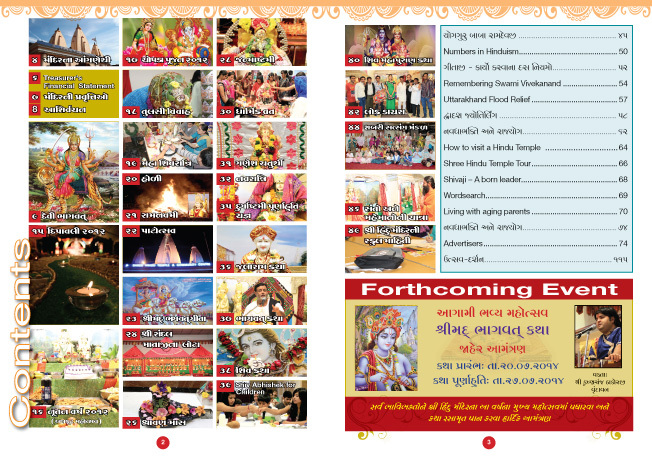 In addition to the ‘official contents, the team puts a number of interesting articles in Gujarati and in English which are chosen to give a essence of Hinduism through factual, moral and religious articles which can be treasured till the next one is printed. 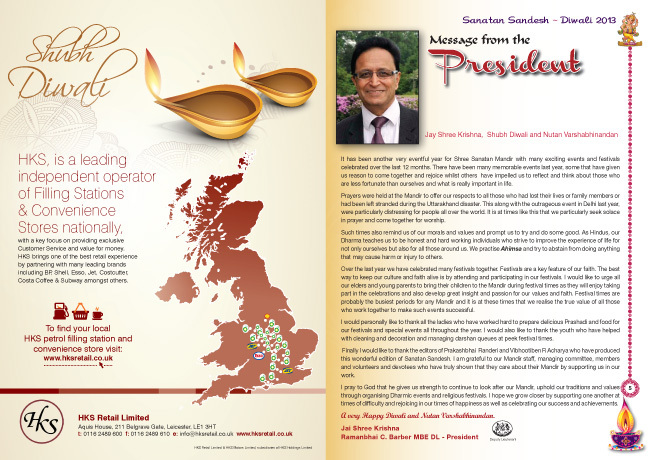 Like a lot of Indian Associations, Shree Prajapati Samaj UK print an annual publication which tends to be prepared by volunteers. 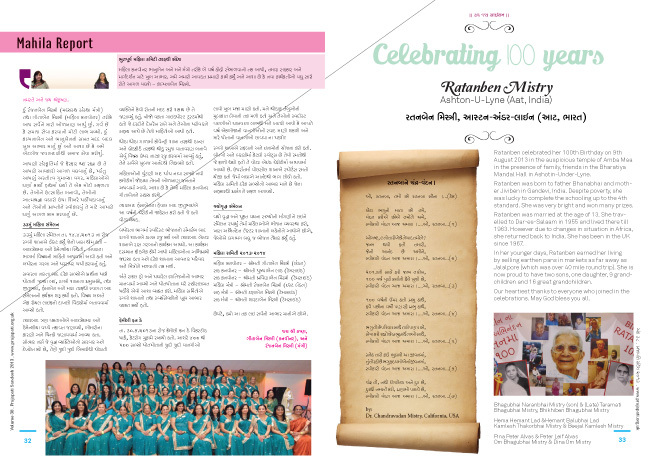 The Editor has held the reins on this publication for over 20 years and this publication is published with a lot of pride and satisfaction. We get involved in the printing, whereas the artworks are prepared by a team of young enthusiastic graphic designers and is pieced together despite them all being from different parts of the UK. 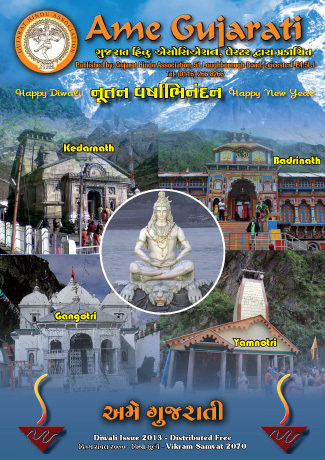 The result is new, fresh and interesting themes which make the publication truly appealing to all age groups with special emphasis to the youth. 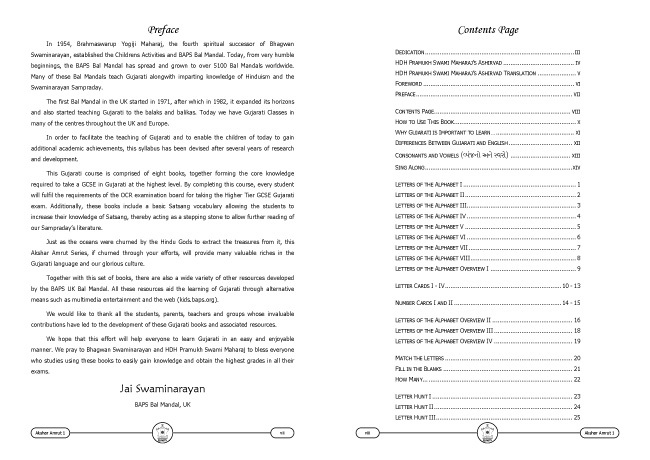 The 2013 the publication was 96 pages in full A4 size. The Cover was matt laminated with a spot UV varnish to give it a special lift. The feedback on the magazine was fantastic. 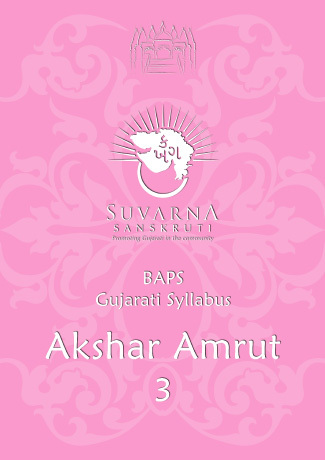 Series of Akshar Amrut – 8 Manuals (Beginners stages right through to GCSE). 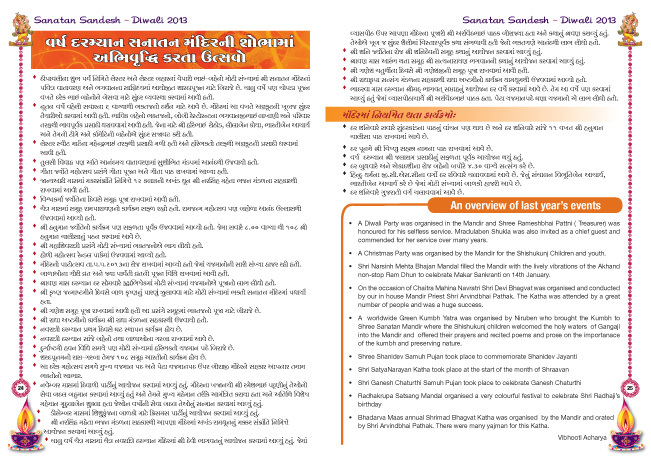 BAPS Swaminarayan Santhsha a total of 8 Gujarati Manuals (Akshar Amrut) which are used in classes across the UK. 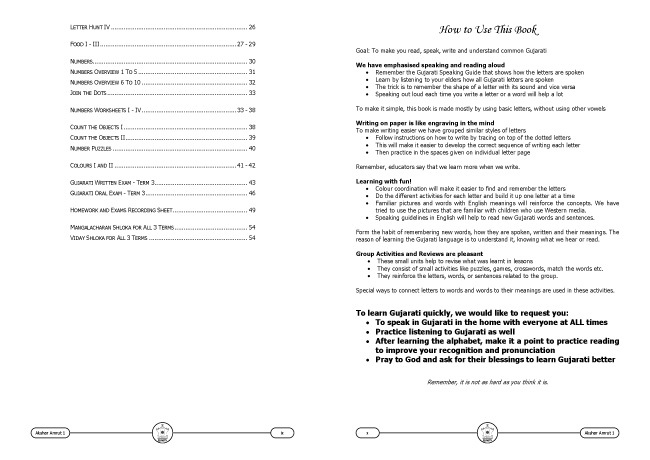 These manuals have been carefully prepared so aid training both for teachers and students and the whole series of manuals showcases the journey of the student in his quest for learning. 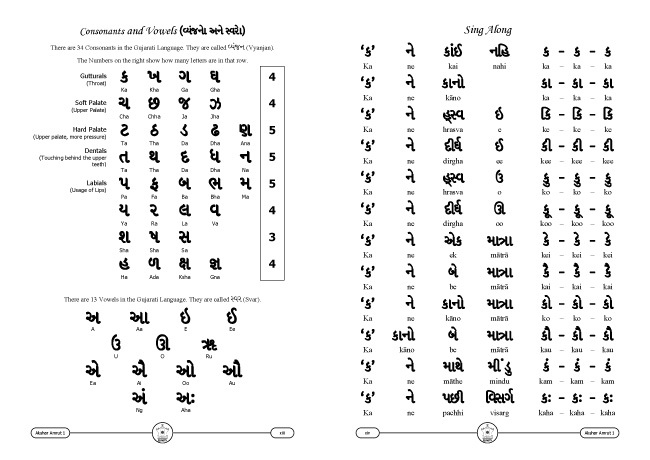 The Akshar Amrut ranges from 76 pages to 176 pages. 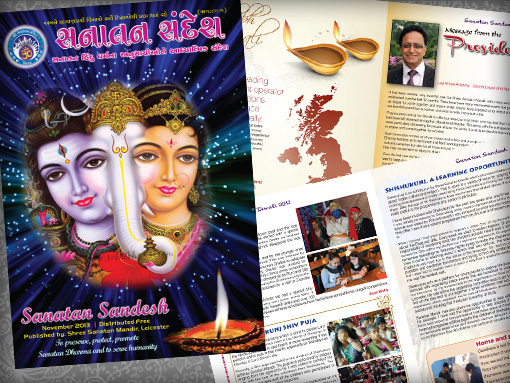 The artworks are beautifully and appropriately designed by BAPS’s Gujarati team to help the learning and experience process. 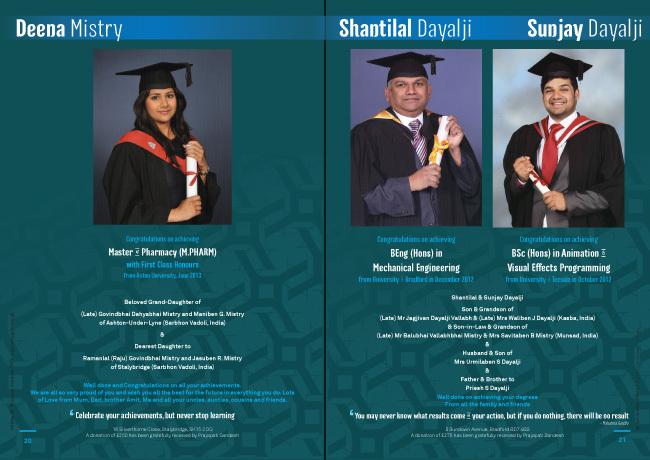 We use digital printing capabilities to put together the exact amount of manuals required reducing storage and waste. 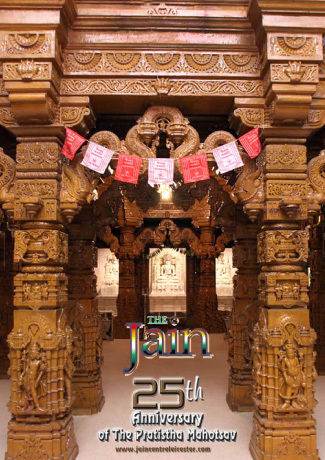 In July 2013, the Jain Samaj celebrated its 25 years. 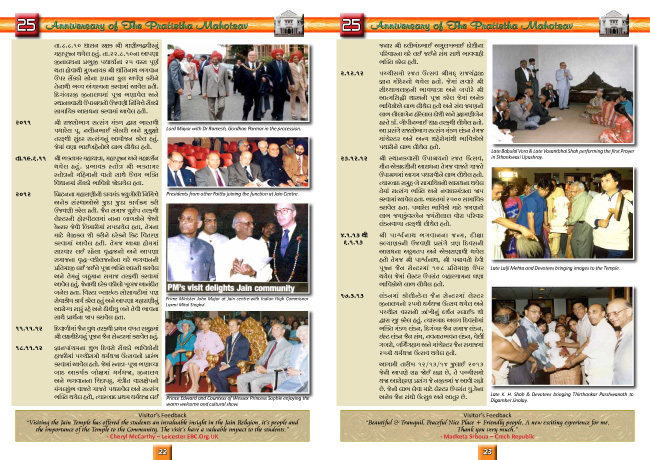 We printed the first souvenir and again, 25 years, the committee had the confidence to entrust us with the publication and we have done all the publication in that time. 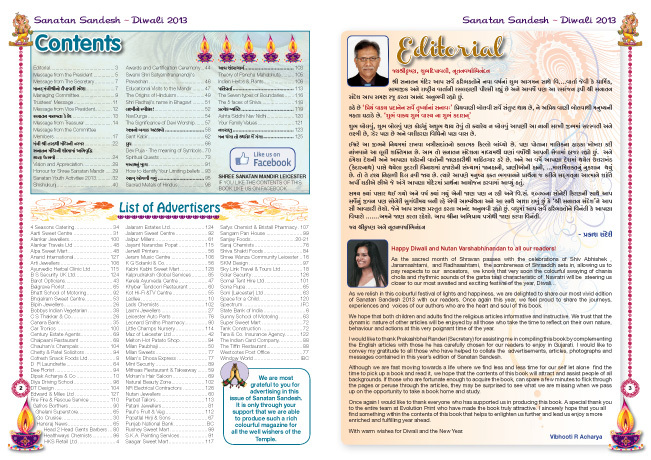 Jain Mandir Leicester supplement with a regular newsletter which is packed with reports of gone events and notice and information about coming events. Whilst, this event happened in 1989, created a “Mini Kumbha Mela” . 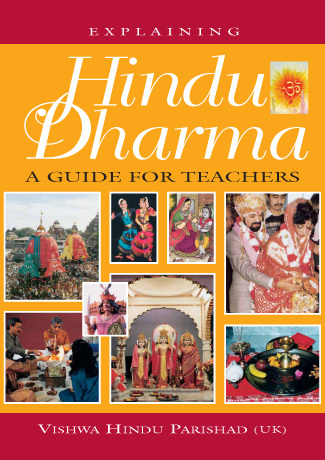 Hindus from 42 countries gathered in Milton Keynes in this epic event outside Bharat (India) in August 1989. This was and still is the largest gathering of Hindus outside Bharat. 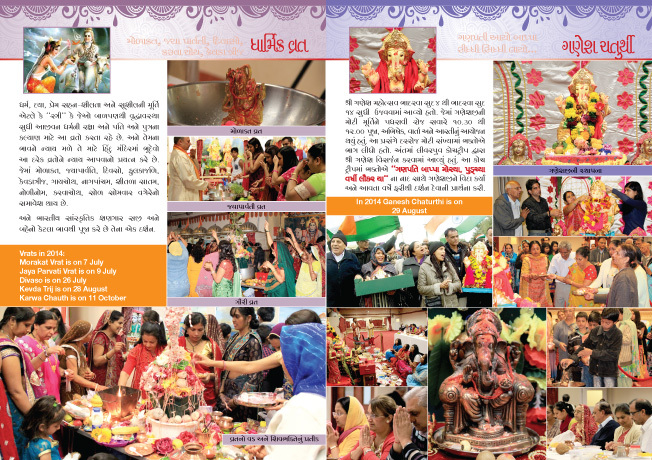 The event was supported by over 300 Hindu organisations in the UK. 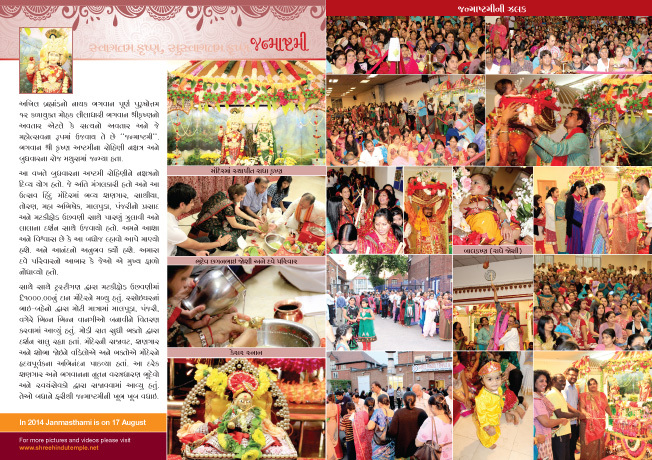 Over 120,000 Hindus displayed their unity by coming together, for two days at this historic gathering. We were involved in the total branding of the entire event which included creating a brand logo with a specially designed and drawn for the purpose. 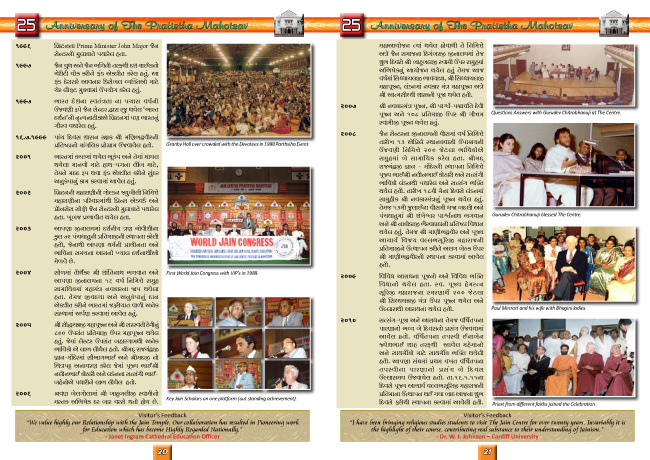 The branding was then used across the entire programme – posters, leaflets, banners, t-shirts, badges etc., were produced in addition to a souvenir. 40000 souvenirs were printed. 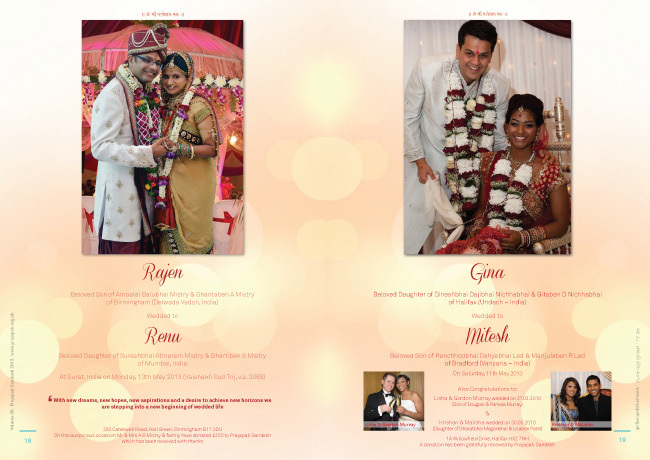 A combination of English, Hindi and Gujarati was used to make the souvenir memorable. 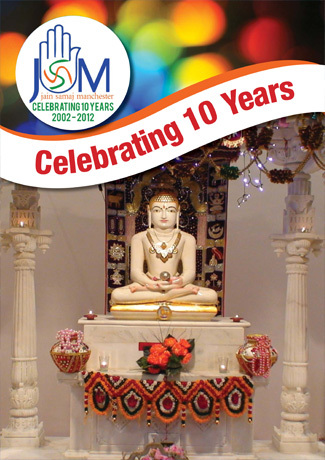 2013 marked the 10th Anniversary for Jain Samaj Manchester’s opening of their Centre and to mark this occasion a souvenir was produced. We were proud to have done a souvenir when the Centre opened in 2002. The purpose of this custom built centre is to facilitate the practice of Jainism for as well as help children understand and become part of the rich heritage. 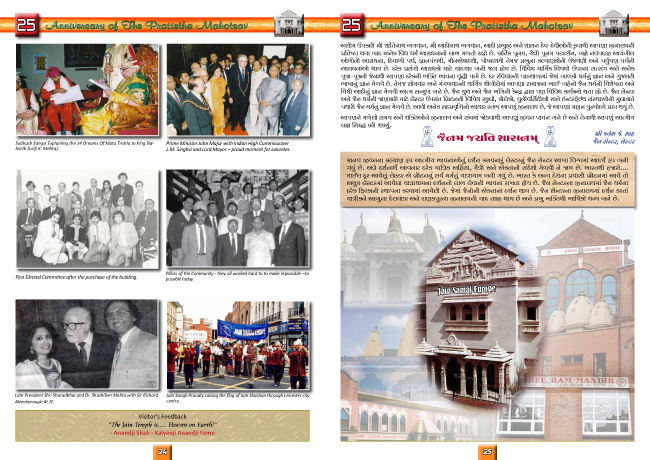 Shree Lohana Mahajan was set up in 1969. 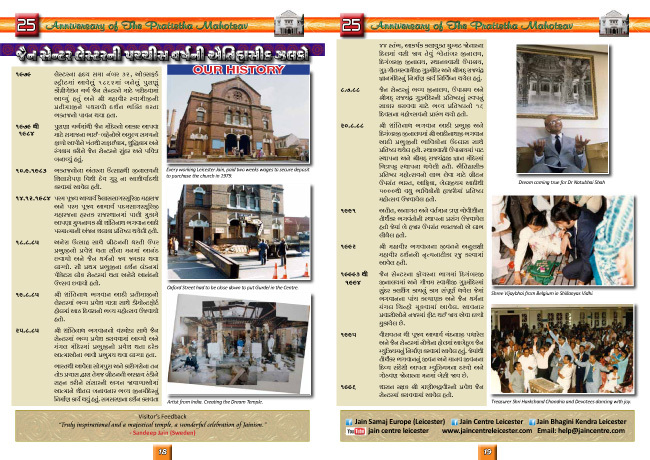 The current building was renovated with Murti Prathista done in 1992 when Shree Ram Mandir was established. 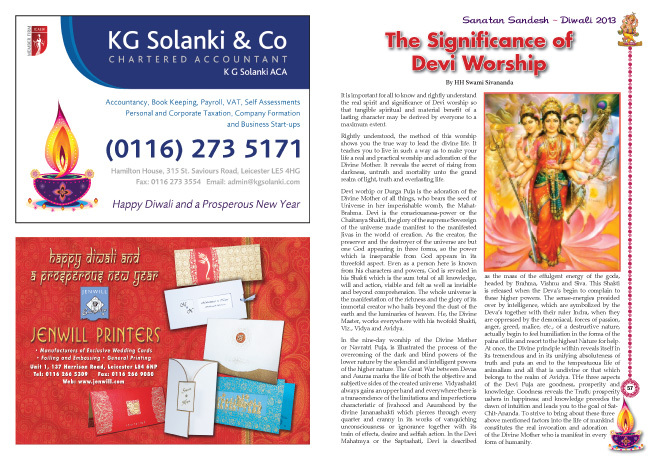 It is now an integral part of the Leicester Hindu landmark. 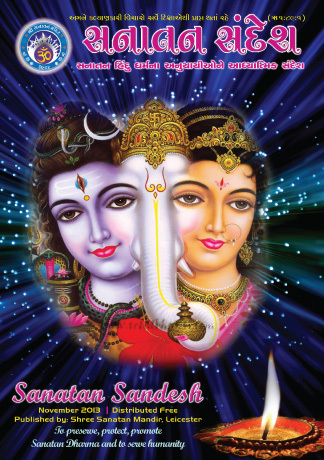 The development of the Shree Lohana Mahajan’s publication is truly astounding. 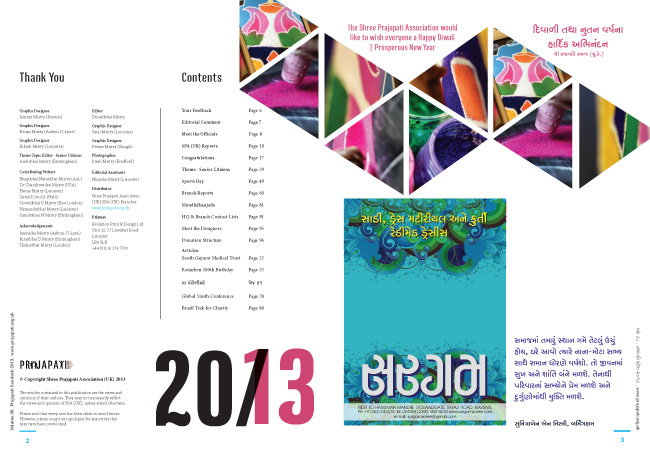 Only 4 years ago Lohana Prakash was predominately printed in two colours. Each year there has been an increase in page count and within that period a 64pp magazine has transformed into a 128 page annual. The committee work hard to get the editorial and advertising mix right and each year the number of advertisement support seems to increasing. Indeed something which raises the bar higher and more challenging. 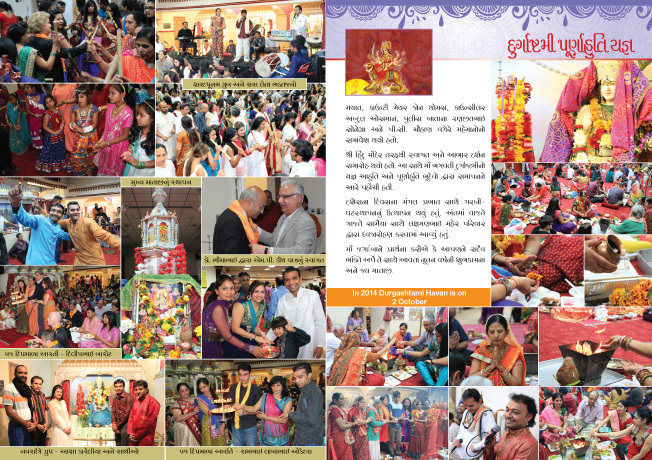 Pushti Nidhi (UK) established Europe’s largest centre for Pushti Marg, with the newest “Shreeji Dham Haveli” temple which opened in 2012. 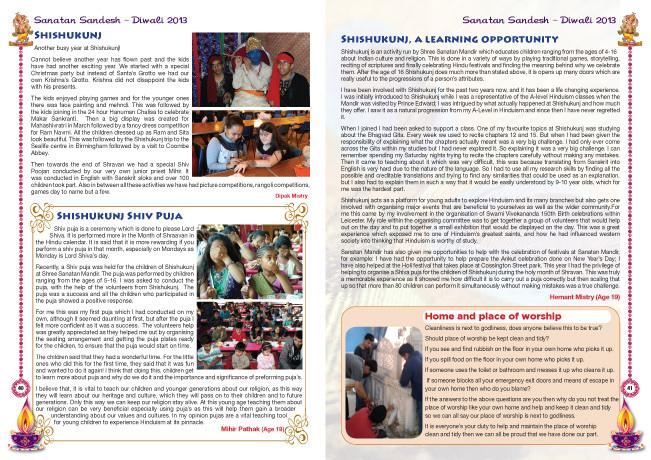 The Shreeji Dham Haveli will be a centre to promote Pushtimarg through various religious, cultural and social activities for the youth and future generations. 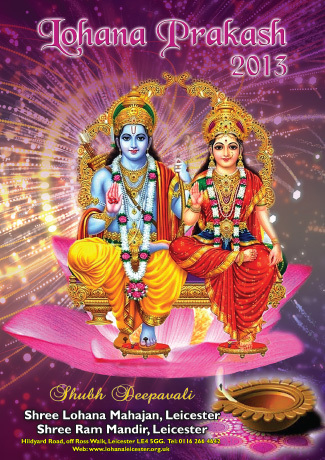 The Haveli is a realization of the wishes and dreams of innumerable vaishnavs of UK and Leicester in particular, who all together take pride and joy and devote their efforts to make “Shreeji Dham Haveli” a beautiful “Nandalay” for ShreeNathji. 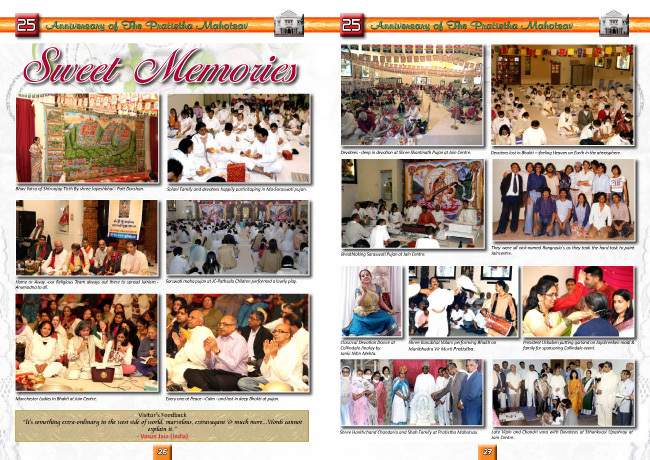 Shreeji Dham Haveli opened in June 2012, and on their one year anniversary we produced their Souvenir. 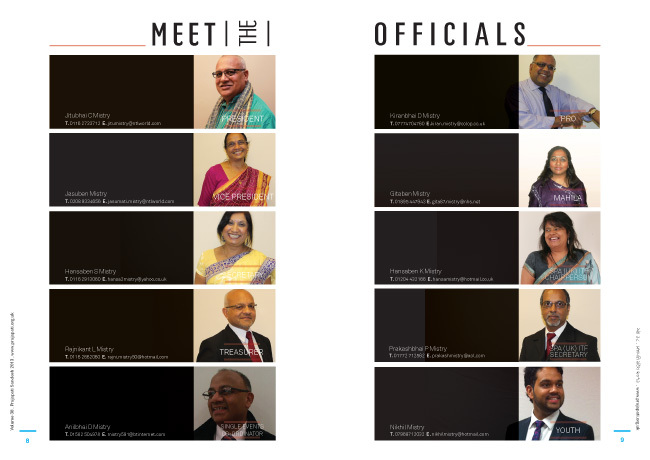 Working with a relatively new team, we helped coordinate the reports from different services and departments and pieced them together to form the final product.